The monsoon-like rains we had earlier this month still has the water discolored and low in salinity. 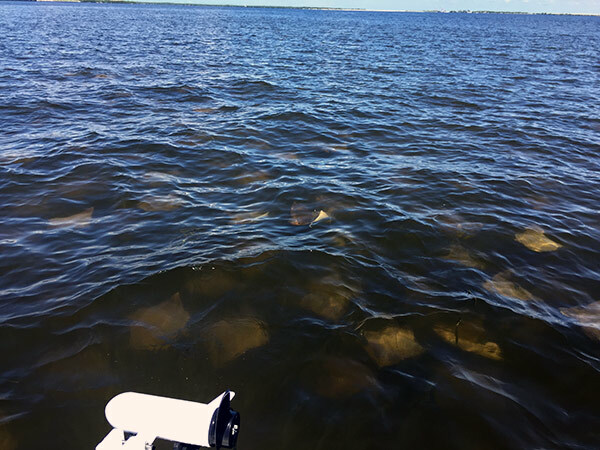 Although some species like spanish mackerel and sharks don't like this and move towards the mouth or even out of the bay, others like snook, redfish and tarpon, LOVE IT!! 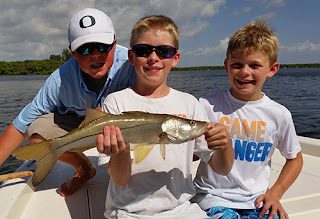 The fishing has been excellent with catches of 20 or 30+ snook not uncommon and schools of over slot redfish also finding their way onto the flats of the upper bay. We've also been battling some big uglies, the black drum that are schooling around the bridges. For some tasty fillet's, the incredible mangrove snapper bite is still going and should continue with the abundance of small bait that we have now. A look around sees a small heron in the mangroves waiting for a fish to swim just a little closer while behind the boat a mother dolphin with her calf play. Overhead an osprey circles sizing up the perfect snack while pelicans relentlessly crash into the water, gorging themselves on the small fry. On our quick run to the beach for a dip and snack we slow to watch a football field of stingrays glide under the boat in their annual mass migration though the bay. 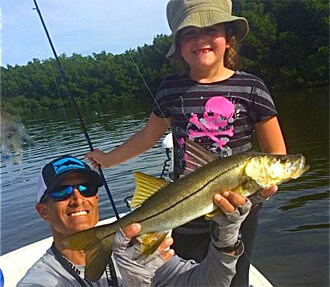 Sure we have a great time catching a bunch of fish but as you can see being out on the water is much more than just fishing. Every day is an adventure and no two are ever the alike. Do yourself a favor, get outside and enjoy the natural beauty that surrounds us everyday. You won't regret it!